Juan Rulfo (May 16, 1918 – January 7, 1986) was one of Latin America's most admired novelists and short story writers. His most commendable achievement was having managed to revolutionize Mexican literature with only two publications. These two books were El Llano en Llamas (1953), a collection of short stories, and Pedro Páramo (1955), a short novel. Rulfo's work has been praised worldwide for how he incorporated magic realism into his fiction while being able to present a cohesive account of an important aspect of Mexico's history as he experienced it. His writing was born out of a vision he had of Mexico in a period where the country failed its citizens despite the myriad of social and economic programs they attempted to incorporate. Magic realism in fiction originated largely in Latin America, representing a response to the "dis-enchantment" of modern life. Very little is known about Juan Nepomuceno Carlos Pérez Rulfo's childhood apart from the few and imprecise facts he announced publicly over the years. He was born in Apulco, Jalisco on May 16, 1918, to a wealthy land owning family on the rural countryside. At a very young age, his family moved to San Gabriel, Jalisco. His ancestors originally came from the north of Spain in the late 1700s. The Mexican Revolution (1910-1920) and the cristero rebellion had serious repercussions on Rulfo's family. As a result of the revolution, his family underwent financial ruin, his father and two uncles were assassinated in the turmoil, and his mother died in 1927 of a heart attack. Since nobody adopted Rulfo after these incidents, he was sent to an orphanage. In an interview conducted by Joseph Sommers in 1978, Rulfo described his childhood as very rough for him. He told Sommers about how difficult it was to live in such a devastated area of the country, where destruction was widespread and took its toll on human lives as well as on the geography of the region. Rulfo admitted to never finding the logic behind the series of assassinations and other acts of cruelty that happened during the Revolution that led to the death of all key members of his family. Rulfo attended the Luis Silva School for Orphans in Guadalajara from 1928 to 1932 as well as seminary and secondary school before moving to Mexico City where he started his career as a writer and film producer. In Mexico City, he studied law at the Universidad Autónoma de México for a short time, where he gave up his studies and worked as an immigration agent for the next twenty years. 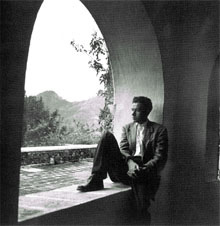 In the 1960s Rulfo became a staff member and eventually director of the editorial department of the National Institute for Indigenous Studies in Mexico. Twenty years later, in 1980, he was elected as a member of the Mexican Academy of Letters. Juan Rulfo died in Mexico City at the age of 67 on January 6, 1986. Among the various narrative techniques employed by Juan Rulfo that made his works so successful, was his ability to capture his reader's attention by making his stories interactive. The ambiguity, chronological ruptures and lack of information provided in many of his short stories compels his audience to participate in the completion of the work as a whole. Monologues, flashbacks, the voice of the dead, and stream-of-consciousness are incorporated into his writing style as well. Rulfo's writing style can also be characterized by the complexity of the colloquial language found in his works. Many editions of Rulfo's publications, even those rewritten in Spanish, cannot be fully appreciated because it is difficult to translate the simplicity and brevity of many of his sentences, while maintaining the essence of language use that he intended to impart to his readers. The following tables from Nila Gutíerrez Marrone's El Estilo de Juan Rulfo, demonstrate how Rulfo's sentence length compares to other Spanish literature authors. Rulfo's sentences are about half as long as Alas' in La Regenta and about a third the length as Márquez's sentences in Cien Años de Soledad. ...el día en que deje de comer me voy a morir, y entonces me iré con toda seguridad derechito al Infierno. Y de allí ya no me sacará nadie, ni Felipa, aunque sea tan buena conmigo, ni el escapulario que me regaló mi madrina y que traigo enredado en el pesquezo. The day I stop eating I will die, and then I will surely go to Hell. And nobody will be able to take me out of there, not even Felipa, even though she has been so good to me, not even the scapulary she gave me that is tied around my neck. By saying this, even with his limited mental capacity, Macario was conveying his desire to stay alive because otherwise he would go straight to hell. Todo esto que hago, no lo hago por usted. Lo hago por su difunta madre. Porque usted fue su hijo. Por eso lo hago. Ella me reconvendría si yo lo hubiera dejado tirado allí, donde lo encontré, y no lo hubiera recogido para llevarlo a que lo curen, como estoy haciéndolo. Es ella la que me da ánimos, no usted. Everything I am doing, I am not doing it for you. I am doing it for your dead mother. Because you were her son. That is why I do it. She would never forgive me if I would have left you lying there, where I found you, and had not picked you up to get cure, as I am doing now. She is the one giving me energy to continue, not you. The father in this short story admits that the only reason for trying to save his son's life was because his wife would not forgive him if he let him die. He recognized and valued the role that his wife played in his life and even underwent a journey that he knew he was not likely to come from alive. Select titles of Juan Rulfo's works. ↑ Juan Rulfo, El Llano en Llamas (Ediciones Cátedra, 2004, ISBN 8437605121). ↑ Nila Gutiérrez Marrone, El Estilo de Juan Rulfo (Bilingual Press, 1978, ISBN 0916950085). ↑ Magdalena González Casillas, La Sociedad en la Obra de Juan Rulfo (Secretaría de Cultura, Gobierno de Jalisco, 1998, ISBN 9706241698). Juan Rulfo (1918-1968) Retrieved February 28, 2008. Seligman, Johanna Juan Rulfo and his novel, Pedro Páramo Retrieved February 28, 2008.